Big Island Hawaii weather is nearly perfect, warm and tropical with more than 350 days of sunshine in certain areas. Across much of the Big Island, the temperate Hawaii climate is complemented by delightfully mild weather, with gentle trade winds and sunny skies most of the year. 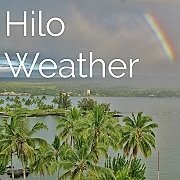 Get today's forecast temperatures all across the Big Island, from sea level to the summit of Mauna Kea, with this interactive National Weather Service map. Trade winds blow from a northeasterly direction toward the equator. This makes the north and east facing side of the Big Island the windward side. Hilo sits directly below Mauna Kea and Mauna Loa volcanoes on the windward side of the Big Island. When the trade winds that bring warm water vapor from the Pacific Ocean begin to rise against these mammoth mountains, clouds form and bring rain, lots of it. Hence the waterfalls and tropical rainforest on the east side of the island. More rain on the windward side makes it lush and cool. There is almost always rain in the Hilo weather forecast. In fact it rains 3 out of every 4 days in an average year. Even during the driest month, Hilo receives an average of 7 inches (18cm) of rainfall. On the other hand, there is sunshine 175 days/year on average. If you were to fly across the Big Island, Kailua-Kona is a mere sixty miles (100km) nearly due west of Hilo, but the weather couldn't be more different. Kailua-Kona is built on the slopes of Hualalai volcano, on the leeward (downwind) side of the Big Island, facing west and south. Since Mauna Loa and Mauna Kea volcanoes separate the rainy windward side of the Big Island from the leeward side, there is far more sun and far less rain on the leeward side. During the wettest month, Kona beaches on the west coast receive an average of only 2” of rainfall. 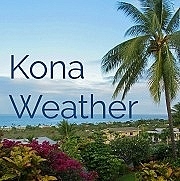 In an average year there are sunny days along the Kona coast more than 95% of the time. Check today's forecast for Kona. Volcano Village and Hawaii Volcanoes National Park are located in the Puna district on the southeast side of the Big Island. At an elevation of 3,750 feet (1,143 meters), Volcano Village is the highest community in Hawaii. Because of this, the climate in Volcano is considerably cooler than much of the island. But what about the weather? 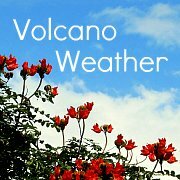 Slightly protected and a bit inland, intermittent showers with periods of sun are likely in the Volcano weather forecast and at Hawaii Volcanoes National Park. Trade winds account for the majority of all wind across the islands. While they may feel refreshing on land, trades can cause problems for mariners, especially as they funnel through the channels between the islands at speeds faster than those found over the open ocean. Strong winds are rare in Hawaii. High pressure systems in the North Pacific can bring stronger wind gusts for short periods of time. Conversely, unusually low pressure within close proximity and northwest of the islands causes the wind pattern to change and blow from the southwest. Known as Kona winds, these winds don’t generally last long but can be quite strong. Be particularly aware of dangerous surf conditions during periods of high winds. Hurricane season in Hawaii runs June through November, although hurricanes and tropical storms are infrequent. No hurricane has made landfall on the Big Island in recorded history. Each time a hurricane has threatened, winds have subsided and it has been downgraded to a tropical storm prior to making landfall. 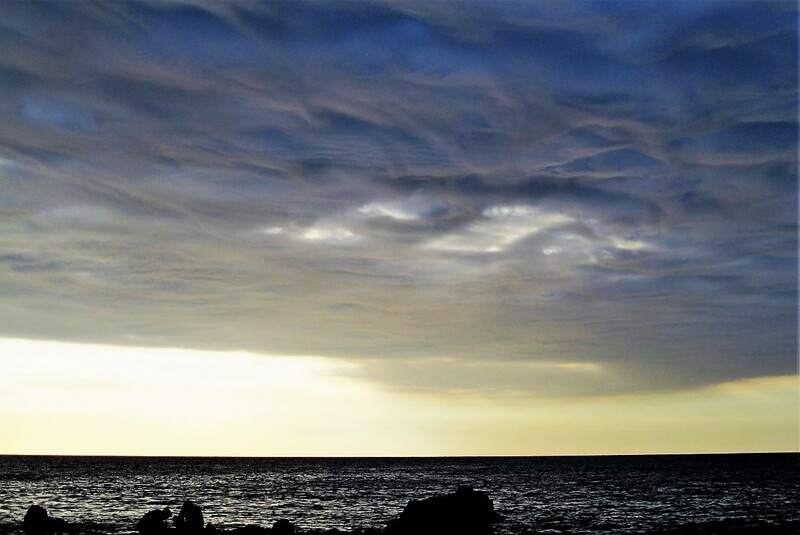 Even thunderstorms on the Big Island are rare. In fact Big Island weather is pretty close to perfect!